This post may contain compensated links. Please read the disclaimer for more info. It’s taken me a while to get on to this Cricut Explore Air 2 review, mostly because I’ve been pretty busy learning all there is to know about this machine. The Cricut Explore Air 2 has a lot of great things going for it. It’s a fast, fairly easy to use machine that cuts detailed designs accurately. And although I’d choose this machine over the Silhouette Cameo 3 most days, there are still some not-so-great features that you should know about. The most important of which is Cricut’s design software. Unfortunately, you can only use your Explore Air 2 with Cricut’s proprietary design software Design Space, and many Cricut users really don’t like its functionality (or lack thereof). Despite this though, I think it’s the best home cutting machine and beginners to craft cutting will get loads of enjoyment out of this particular model. The features on Cricut’s Explore Air 2 model are undoubtedly leading the way in the home craft cutting market. This latest Cricut cutting machine is fast, versatile, accurate and so, so easy to use. It’s no wonder there are so many converts to Cricut, adding to their swelling base of raving fans. And to be honest, I can see why! 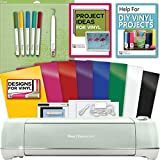 The Cricut Explore Air 2 is most suitable for beginners who want to dip their toe into cardmaking, scrapbooking, and cutting vinyl transfers to add to their favorite tee. And the Cricut Explore Air 2 doesn’t disappoint. In fact, I’d also recommend this machine for small home-based businesses such as those found on Etsy. However, a word of caution: if you’re running a larger commercial business looking to add vinyl cutting services, then this machine just won’t do and you’re better off considering something like a KNK Zing Orbit. You can see my comparison chart to many different vinyl cutters on the market here. Okay, now we’ve got that out of the way, let’s take a deep-dive into what makes the Cricut Explore Air 2 such a leader in its class. The Explore Air 2’s best feature has to be its cutting speed, which is twice as fast as the earlier Explore Air model, released in 2015. And although Cricut haven’t given us an exact specification on just how speedy the Explore Air 2 can be, the difference between this model and the Explore Air is quite remarkable. If you’re anything like me, waiting around for longer than I have to while my project gets cut is almost as exciting as watching my paint dry, so a machine that can cut down on that time is very welcome indeed. There is one major disadvantage though: fast mode only works with iron-on, cardstock and vinyl. Considering these are the three most commonly used materials, I guess that’s not too bad, but it is a bit disappointing. 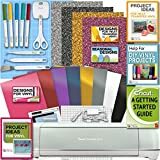 According to Cricut, the Explore Air 2 can cut over 100 different materials — from lightweight vellum, to cardstock, to leather — which makes this craft cutting machine particularly versatile. Most dedicated vinyl cutters can only cut a few different types of vinyl, so if you think you’re going to be cutting other types of materials, then buying a versatile cutter such as this one is a good idea. Before you rush out and purchase your Cricut Explore Air 2, be aware that the cutting force on this model is still only 210gf (the same as the Cricut Explore and Cricut Explore Air), so if you’re looking for an upgraded cutting force, you’ll be sadly disappointed. Combine this with only being able to cut materials up to 1.5mm with the standard blade, or 2mm with a deep-cut blade, then you’ll need to look to another model such as the Cricut Maker (which has a cutting force of up to 4kg, which, incidentally, is the same cutting force as KNK’s Force). With its “smart-set dial” it’s really easy to adjust this machine’s settings for accurately cutting the most common materials. The automatic settings make it easy for everyone from beginners to experienced vinyl cutting pros to get terrific results straight away. However, if you want to have more fine control over your cutting settings, then the Cricut Explore Air 2 isn’t going to be the machine for you. This machine does everything for you, so it’s impossible to manually finetune this machine’s settings — which will be a deal-breaker for some craft cutting enthusiasts. Despite this lack of fine control, this Cricut model is a great machine, particularly for beginners and hobbyists. If you’re a long-time Cricut customer, then you’d be very familiar with old cartridge system used by some of their older machines. Like many Cricut fans, I really wasn’t fond of buying cartridges for a couple of designs I wanted while knowing there were heaps in the pack I wasn’t likely to use. So when Cricut’s first brought out the Explore, I was thrilled not to have to purchase cartridge packs any more! But … what to do with the old cartridges I had already bought? Thankfully, I can still use them in this Cricut cutting machine, so they are not at all wasted as I upgraded my hardware. Thank you Cricut! 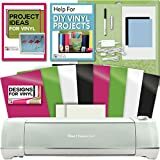 This Cricut machine is terrific for casual craft cutters and vinyl cutting beginners, so if you’re expecting it to perform as well as the more expensive dedicated vinyl cutting machines, you’ll be sorely disappointed. 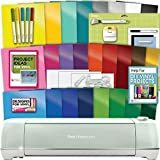 And although I love my Cricut Explore Air 2 (because the things it does well, it does REALLY well), there are some features and limitations that you I need to let you about before you buy. As much as I love this Cricut model, I have to admit, I’m pretty disappointed in its maximum cutting dimensions. Out of all the vinyl cutting machines I’ve reviewed, the Cricut Explore Air 2 accepts the smallest media dimensions of all. This machine can only cut media up to 12 inches wide by 24 inches long. And this makes me sad because it’s closest rival, the Silhouette Cameo 3 can cut media up to 10 FEET long. What’s the go here, Cricut?! Even sadder still, when using this cutting machine in the print and cut function (which means you print out your image then use the Explore Air 2 to automatically cut it out), then the media dimensions are even further reduced. Yup, if you want to use this machine in Print Then Cut mode, your maximum media size is a measly 8.5″ x 11″ – which translates to a maximum print size of just 6.75″ x 9.75″. And that’s just … disappointing … to say the least. I initially thought it just might be me, because I’m used to using professional graphic design programs such as Adobe InDesign and Illustrator, so I was willing to overlook Design Space’s flaws. After all, Design Space is intended to make using your Cricut simple, easy and fun. And for the most part, it IS simple and easy and fun. But only when you’re using Cricut’s included designs or have a monthly Design Space subscription. And this is a sticking point for me. After spending some decent coin on buying the machine in the first place, having to spend more money every month to make the most out of that machine just annoys me. It wouldn’t be so bad if it was easy to upload my own files to Design Space … but although it can be done … it’s not the easiest of tasks to master. And you know how I thought it was just me? Well, it’s not. In fact, of all the reviews I’ve read, the consistent gripe of Cricut customers is Design Space. You can take a look at some of the reviews here. Go on, I’ll wait! And while we’re talking about it, the Design Space app is only compatible with iOS. The Android version has been ‘coming soon’ for months and months now, and apparently is available in a beta version — but seriously Cricut — exactly how long does it take to build an Android app?! Sheesh! It might seem like just a few small things, and in all honesty, these ARE small things, but they do impact on the Cricut’s usability and user-friendliness, and so it wouldn’t be right to not include these small things. I mean, while they are not necessarily a deal-breaker for me, they might be for you. And it wouldn’t be right of me not to bring them to your attention, right? Right! Cricut’s Explore Air 2 is a great option for beginners to vinyl cutting, and a terrific addition to your home crafting room. It’s perfect for small jobs, and hobby projects, and may even be useful for small home-based craft businesses. Overall, it’s pretty easy to use, even despite Cricut Design Space’s flaws, and is a versatile machine capable of a lot more than just cutting vinyl iron-on transfers. If you’re new to the wonderful world of craft and vinyl cutters, then start here. My Ultimate Guide To Finding The Best Vinyl Cutter To Suit Your Needs will answer any question you never thought to ask! Check out my comparison chart for all the top vinyl cutter machines here.